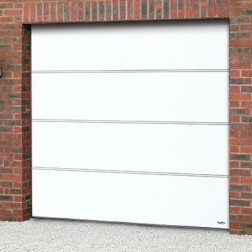 Sectional garage doors are by far the most insulated doors available. Made up of individual sections and connected by hinges, sectional garage doors simply rise vertically up tracks and back into the roof space of your garage. All our garage doors, unless otherwise stated, come complete with lock/handle/fitting pack and full instructions. All sizes given are Width x Height. 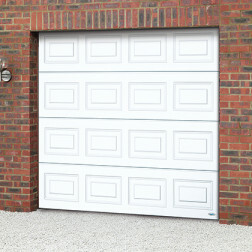 Sectional garage doors fit behind the brickwork so the door size stated is the size that your opening needs to be. For more information please visit our Technical Help page. Our sectional garage doors are available in a range of colours and finishes, and any specific RAL colour by special order. You really can make a unique design with these doors. The glazing options above are for windows going across horizontally along the top panel. However, for other design options or for bespoke porthole windows please call us to discuss your requirements.